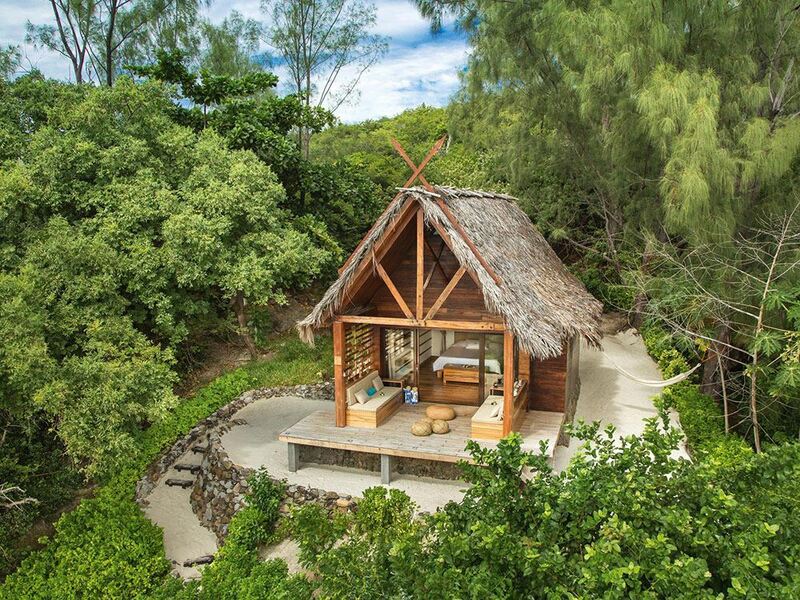 A real contender for the most stylish and upmarket beach lodge in Madagascar! If you're in search of a truly intimate and romantic retreat, then these 8 bungalows perched above a lovely sandy beach on beautiful Nosy Komba come highly recommended for honeymooners and romantics! The whole vibe here is to foster an ambiance of romance, tranquility and relaxation, and boy does Tsara Komba succeed! Excellent food and service - some of the best in the whole of Madagascar! They do take children - but our advice is to leave the kids at home and soak up the tranquility and romantic ambience with just your other half! it all adds up to probably the most romantic, serene and stylish of all the beach lodges in Madagascar - for honeymooners and romantics Tsara Komba is absolutely perfect! 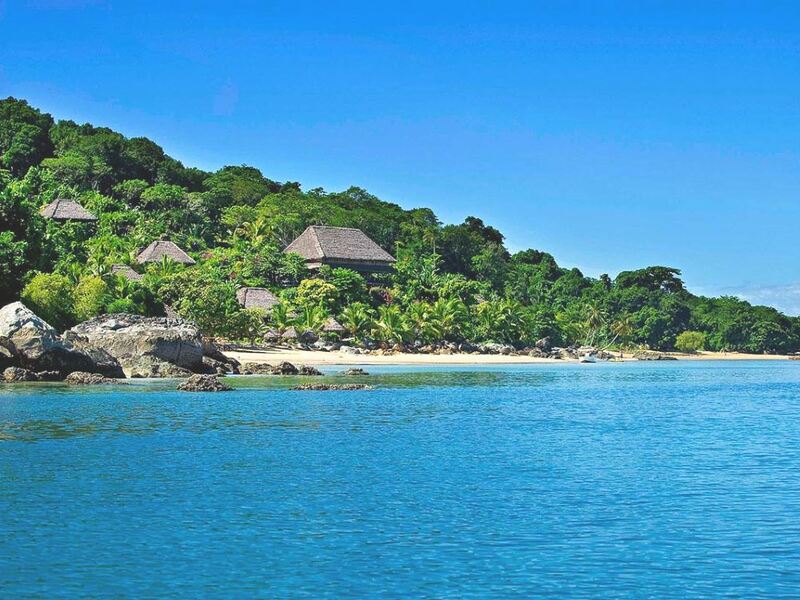 Tsara Komba is located on the southern tip of Nosy Komba, a gorgeous, densely forested island just south-east of Nosy Be itself. 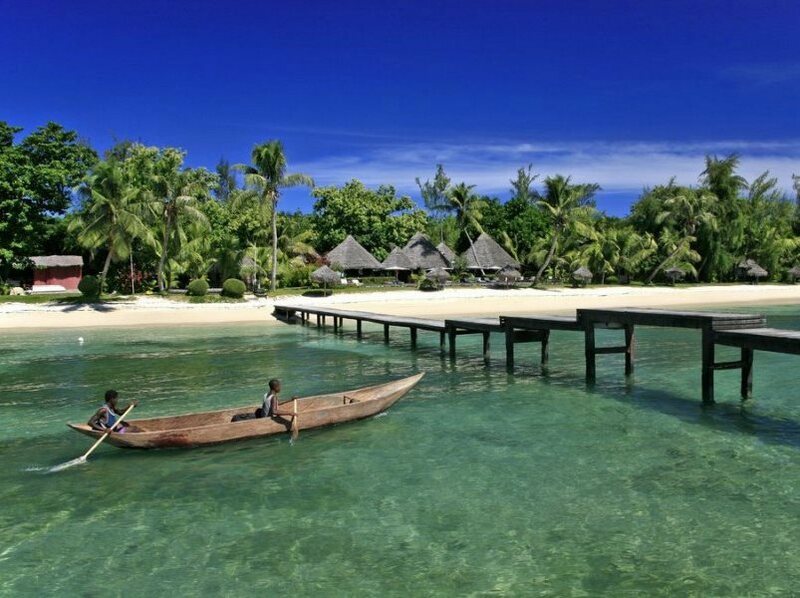 Approaching the lodge from the sea, you'll see the very spacious thatched bungalows nestling in gorgeous tropical gardens on a forested hillside overlooking a lovely sandy beach and the turquoise waters of the bay. Built of traditional materials, the bungalows at Tsara Komba are extremely stylish and minimalist - in fact they're the nicest rooms we've yet seen on our travels in Madagascar! In fact, the entire lodge oozes serenity, sophistication and natural elegance and luxury! The rooms all boast wonderful, highly polished wooden floors which feel gorgeously sensuous under your bare feet and these wooden finishes are also carried through to the walls and furniture. The interiors each have a king-size four-poster bed, but what we especially loved were the large private verandas where you can relax with a good book whilst watching the dhows sail serenely by on the cooling breeze. Six of the bungalows (75m2) are set amidst the beautiful landscaped tropical gardens on the hillside (in fact the gardening team at the lodge deserve an award as the lodge gardens are just so stunning!) and can accommodate an additional single bed. Then there are two larger bungalows (95 m2) standing just above the beach - these have an additional living room, which can be turned into a second bedroom for families or friends travelling together. The restaurant, bar and deck enjoy fantastic views out to sea and are a fantastic place to relax with a cold beer or cocktail! Stylish touches and attention to detail abounds, with African masks and sculptures adding to the classy decor. The food is also superb and the lodge restaurant is quite rightly acclaimed as one of the finest in the country. A fantastic selection of fresh fruit and superb seafood are highlights, but if a constant diet of seafood gets to be too much why not try a juicy and tasty Zebu steak! There’s also a decent wine selection, but ask the barman to whip up one of Tsara Komba’s famous coconut rum punches before you settle down to watch the spectacular sunset over the distant mountains! There’s plenty to do other than gaze at the gorgeous view though. The sandy cove below is beautifully manicured whilst retaining a natural feel - it offers excellent safe swimming or you can relax on a lounger and get in some serious sun worshipping. Snorkelling is available off the beach in a little cove around the corner from the lodge or you can enjoy a excursion by boat to the fantastic reefs off nearby Nosy Tanikely (speak to us and we'll tell you of the secret spot where you can swim with heaps of turtles!) Perhaps learn to sail a pirogue or head off a deep sea fishing adventure. Back on terra firma, explore the forest and garden surrounding the lodge and you may be lucky enough to see some of the wealth of interesting wildlife – including black lemurs, chameleons, snakes (harmless!) gorgeous sunbirds and butterflies. 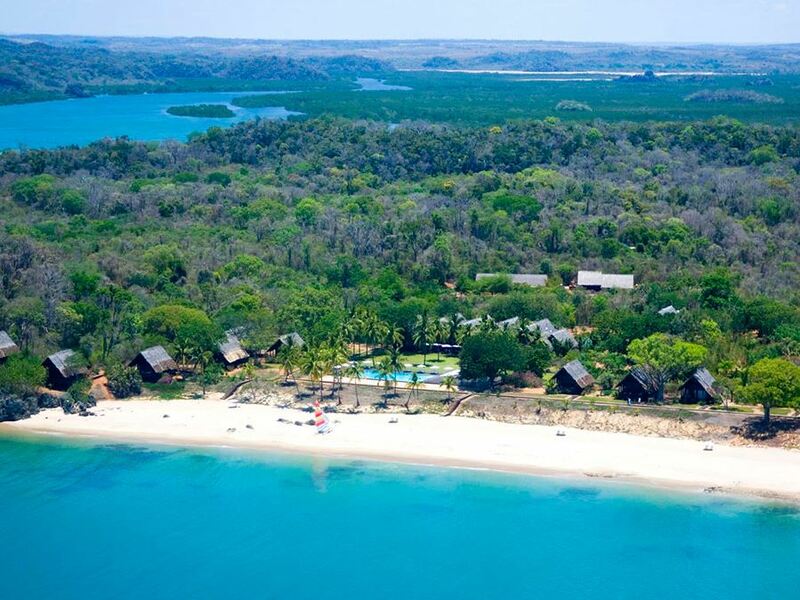 Some will feel that it’s a pity that Tsara Komba doesn’t occupy it’s own exclusive island, such as Nosy Iranja and Tsarabanjina for example - having said that, it does occupy a stunning beach location in its own right, and the standard of accommodation is definitely higher than the afore-mentioned lodges. In fact, with the interesting little villages nearby giving guests the chance to observe locals going about their traditional lifestyles, some travellers may find Tsara Komba (or “TK” as they refer to themselves) offers a more interesting overall experience. The 25 luxurious rosewood villas of this Relais et Chateaux property lie on an extraordinary peninsular of untouched bays, Tsingy forest, coral reefs and lemurs - Madagascar's top rated resort.